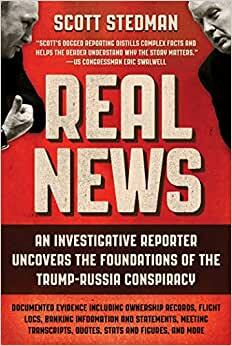 Investigative reporter Scott Stedman has made waves worldwide with his hard-hitting investigative journalism, going as far as anyone has to uncover the deep roots of the Trump-Russia Conspiracy. His research has been cited by the Washington Post, BBC, Reuters, CNN, McClatchy, the Daily Mail, the Guardian, and Vice, and has even helped guide Congress’s investigations. Full of real, exclusive evidence including ownership records, flight logs, banking information and statements, meeting transcripts, maps, quotes, stats and figures, cease and desist letters, and more, Real News not only enables readers to see and evaluate the arguments for the existence of the Trump-Russia Conspiracy for themselves, it also fully explains how Stedman went about his investigations to discover the truth. Anyone who is interested in the evidence—the real news about the Trump-Russia Conspiracy—needs to read this book. Start reading Real News on your Kindle in under a minute. Scott Stedman is an investigative journalist active in covering the Trump–Russia scandal. He has written articles for the Guardian and the Atlantic, and has been cited in, among others, the Washington Post, BBC, Reuters, CNN, McClatchy, Vox, and VICE. He studied Political Science with an emphasis on American government at the University of California, Irvine and received his bachelor's degree in 2018. The title of this book should be "Without evidence". Not really a book with chapters this is presented as a series of articles. The articles often restate previous articles. No verifiable facts or even footnotes exist at least in Kindel version. This is a short book densely packed with evidence—not hypotheses—pieced together in a coherent and convincing fashion. A great read for those who want to see the receipts on Trump-Russia. Scott does an outstanding job writing about the importance of journalism in the social media and internet era, especially the granular assessment it takes to investigate a set of complex topics like money laundering, national security and politics. A young rising star in journalism finds himself in the middle of real news related to the Trump-Russia investigation at a time partisan politics are at an all-time high. Facts matter and this book goes a long way towards the truth of what happened in the 2016 election. 5.0 out of 5 starsReal news, current news and a taste of the good, bad, & ugly. Having spent the majority of my life swimming amongst the political sharks of this world I found this particular effort to be a refreshing reminder of why I dipped into political raging rivers in the first place. Back in the day we wanted to change the world and there was a RIGHT way to do it. Mr. Steadman offers his insights with back-up and examples. He is meticulous and detailed - and works diligently as reporters and public officials & servants of a bygone age. Kudos to this author. And to all, this is worth your time, effort and money. And he is a cute kid too...LOL! This book is excellent for what it is - a longer treatment of the main topical areas Scott writes about on Twitter and Medium (and elsewhere), with an introduction that discusses the author's focus and motivations in becoming a journalist and how he goes about his work. But if you are looking for "Proof of Collusion" with citations for every sentence, that is a different book (written by Seth Abramson). With 5 topics over about 160 pages (plus 10 blanks ones at the end in my copy?) and a few black-and-white images relating to the content, this is not going to satisfy you if you're looking to get a comprehensive understanding of the entire investigation, or "check Scott's work". But the type of work Seth does is not approachable for everyone, so this is a good alternative for someone looking to read about a few key topics without having to learn everything that's ever happened directly or tangentially to Trump dating back to 1979.